Well, the answer to this question is both yes and no. 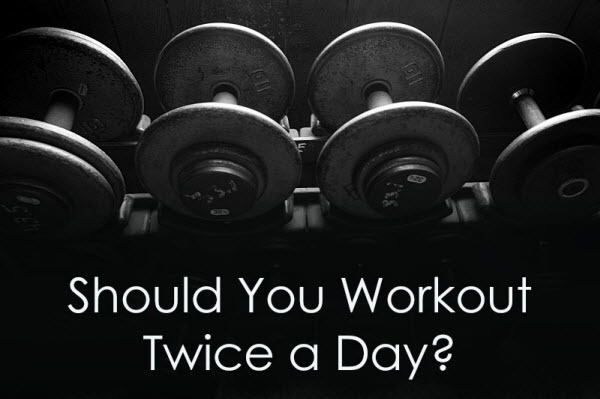 It depends on the type of workout you are doing. If it’s a hard training for muscle gain then it’s a strict no. On the other hand, if your main goal is to get lean and lose fat, then you can workout twice a day, but both your workouts have to be properly planned and categorised. For example, you can keep your evenings for Cardio and lift weights in the morning, or vice versa. It just that you have to give enough stress to your body to burn a certain amount of calories in a day. Here is how it works in plain English. A normal body requires on an average of 2200 calories in a day, that’s the amount required to fuel your body. If you maintain a calorie deficit, i.e, consume less than 2200 calories in a day, you will lose fat. But you cannot go below a certain level of consuming calories for reasons like low energy, appetite etc. You surely can make your body require more than 2200 calories to increase the caloric deficit, and the more is your calorie deficit, the most you will lose fat. So, if you are looking for losing fat, working out twice a day is not going to harm you at all.